Much Like the Roasting process, Coffee Brewing is a magical blend of art and science. Everyone finds their favorite methods and ratios to their own perfect cup. These guides serve as a good place to start for the novice home brewer. The grinder you use, coffee you choose, and yes, even the water from your sink, can alter the taste in the cup. Every machine and method is different, so you’ll want to think of these guides as just that and not coffee law. Play around with your methods, technique, and ratios to find your own perfect cup. ​We can not stress enough, the importance of good clean water and the proper grind. Coffee is always best when ground just prior to brewing. We always recommend using a burr grinder versus a blade. 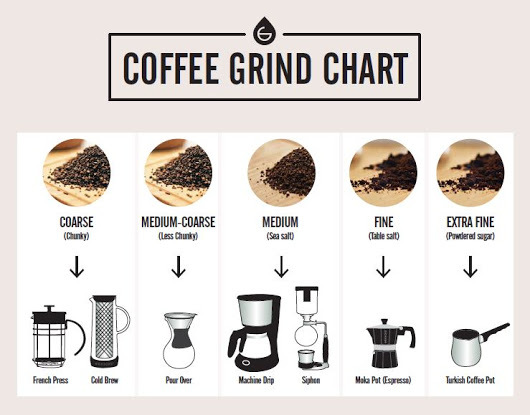 Check out this easy to follow Coffee Grind Chart.